TBK Bread Dipping Herbs 3 oz. Homepage > Specialty Food Ingredients > Herbs & Spices > TBK Bread Dipping Herbs 3 oz. Now you can dip your favorite bread in homemade dipping oils just like at your favorite restaurant. 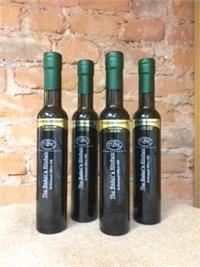 Pair our great selection of dipping herb blends with our TBK EVOO olive oils. So much healthier than butter! Our blends are all-natural and contain no fillers. To make a classic bread seasoning dip, mix 3 tablespoons Bread Dipping Seasoning with 1/2 cup of your favorite olive oil. You can, of course, easily adjust this with more or less seasoning to suite your family’s tastes. For best results mix it with oil and let the flavors marry for 20-30 minutes before serving. Tuscany Blend- This one is inspired by and named after the Tuscany region in Italy. This region is best known for its light cooking style and use of fresh local ingredients. Contains: salt, garlic, black pepper, onion, red pepper flakes, rosemary, basil, Mediterranean oregano and parsley. Sicilian Blend-Sicily is unique to the rest of Italy and many Sicilians even think that Sicily should be its own country. Olive oils & seasoning from Sicily's coastal region tend to have intense flavors. Contains: garlic, tomato, smoked sweet paprika, chipotle, basil, brown mustard, oregano, bay leaves, marjoram, thyme and rosemary. Milan Blend- Our Milan Bread Dipping Seasoning was inspired by the people of Milan who love their bread and their slow paced meals. Contains: onion, tomato, garlic, black pepper, tarragon and basil. 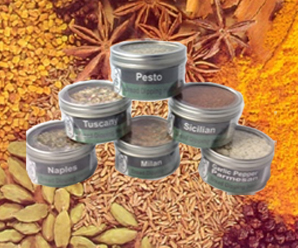 Naples Blend-This blend is named after the largest city in southern Italy, Naples. Southern Italian cuisine is considered to be the "soul food of Italy". The cuisine tends to be spicier than northern Italy. Contains: toasted onion, oregano, basil, thyme, rosemary, roasted garlic, red bell pepper and marjoram. Pesto Blend- This classic herb blend will bring the flavorful pizazz of fresh pesto to your bread dipping. So delicious! Contains: basil, parmesan cheese, oregano, garlic powder and spices. Garlic Pepper Parmesan Blend- This blend is loaded with the rich flavor of parmesan cheese and well-balanced with the zip of garlic and cracked black pepper, warning: it's addictive!! Contains: parmesan cheese, whey, buttermilk,solids, sodium phosphate, salt, garlic pepper, herbs, soybean oil.